Concealed behind her veil of calm, the witch, that is the third world war, knocks at the door. For man the world over, this present moment, here and now, seems engulfed in mist, a mist rendered thicker by the fumes of guns and grenades. Take the Indian citizen. There were bomb blasts in trains, at stations, in taxis; now the perpetrators are bolder, they enter residential buildings and gun down hundreds in hotels. As of the year 2008, we have begun to talk ‘war’. But then do we realize that we are already suffering war? Do we know that war is now neither restricted to the boundaries nor fought only between armies of nations? That there is biological and chemical warfare and synthetic rain is a weapon? That neither 9/11 in the USA nor the 26/11 in Mumbai are ‘isolated’ incidents of national concern, they are drumbeats of war, the third world war? Taking war to be a vent of political discord and a decision of ruling authorities, and also a ‘sudden and unexpected manifestation of secret schemes’, the common man misses out cues of war in happenings around. But then, if we, the common people, are going to bear the direct brunt of war, we must be able to connect with the present moment, with the truth of it. We must understand political developments across the globe, as moves in one nation have repercussions on others. That is how we will ‘see’, become aware, and ably prepare. That is how the mist will clear. 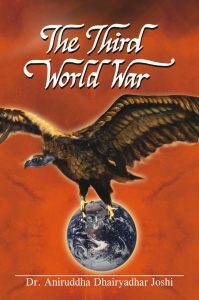 A unique work, ‘The Third World War’, a need of the hour, strikingly relevant to the present times, does it for us. Authored by Dr. Aniruddha Dhairyadhar Joshi, M.D. (Medicine), a consulting Rheumatologist and the editor of the leading Marathi daily ‘Pratyaksha’, this is a consolidation of a series of articles that he wrote for the daily in March 2006. Fondly called ‘Aniruddha Bapu’ by millions of his followers, his pen has touched all aspects that concern values and well-being of man. he claims to be a simple, common human being, ‘one among you’ as he puts it; but millions consider him their God, their Father, their true Friend, their Sadguru. Written out of concern for ‘friends’ the world over, and to acquaint them with at least 2% of what the world war means, this work is on a mission: firstly to wake us up to the fact that it is war, to equip us to understand the political scenario and prepare. As for India, our motherland, it has a role to play; and the Indian, also a citizen of the world, must know it, do it and our time has already started because ‘Concealed behind her veil of calm, the witch that is the third world war, is already knocking at the door’. On a journey, we connect with the past – the two world wars that happened and thus equipped, reflect over the times to come. Studying the present in this light, we see the similarities in the ambitions and strategies of Hitler, Osama and Saddam Hussein. Similar minds with a similar set of cards would make similar moves would they not? The point is to spot the pattern but also to know that the ‘new avataar of Hitler’ is quite another! The work does not ‘tell the future’, it is a research into the phenomenon of war, the characters and props on the stage of the world set for the event of war, its likely design and the sequence. Statements about the coming times like ‘There is no doubt that over the next 20-25 years, conflict will become an aspect of everyday doings and on every region on earth.’, ‘the calendar of the coming war will be a new one every day.’ are part of factual study. However, the work stands firm by statements that ‘though he was declared dead by official sources of the Al Qaeda and the USA, Abu Musab Al Zarquawi, will indeed emerge a radical commander of the third world war. China has imperialist ambitions of expanding its map and to first establish sway in Asia it is wooing Asian countries. They are eager to welcome it in SAARC India being the only factor that stands in its way. Its wish to enhance relations with India is a facade, for it is promoting terrorism in India’s north-eastern area. Pakistan is referred to as the apple of China’s eye, its foster son, its right hand. Most terrorist organizations and their activities can be traced to Pakistan, says the 9/11 commission. Now, the stand that this country has taken vis-à-vis the terror attacks on Mumbai and the continual denial of evidence that obviously indicates its involvement, its withdrawal of troops from the Afghan border, the fact that it thought of China in this critical hour and struck a deal with it only endorse its intimacy with China and its persistent crafty attitude towards India. North Korea, a puppet in China’s hands, will naturally comply with China’s wish. Also, the stately road to North Korea passes through Pakistan but originates in China. So the work convinces because it talks facts all along and connects them for us on the global jigsaw. We even read the likely design of the third world war: ‘The war between Israel and Palestine will be the point of origin and sparks will then spurt out in all directions’, says the work, backing up the statement with a complete study of the history of these nations. Eventually the terrorist forces will align on one side and the super powers on the other. The air attacks – the ‘all out’ war by Israel against the Hamas as we know, has indeed begun. It is more than ten years since the articles appeared in March 2006. Major events on the political scene ever since, or their indication find mention or explanation in the work, be it the war between Israel and Palestine, the increased instances of violence, India’s position in the world or even vis-à-vis China, Pakistan and the USA. With war emerging as an inevitable event and technology now at its sophisticated ‘best’, weaponry becomes an essential part of this work because preparatory and protective measures are most effective if the nature and source of disaster is known. And so we read about chemical, biological, space and guerilla warfare along with desert and naval warfare. This, as is clarified, is to educate and competently face. The inside flap of the back cover has a very reassuring message: “I stand to avoid or at least minimize the cruelty and destruction that is coming closer.”- words of Dr. Aniruddha Joshi. War is inevitable. What then can change? The way we respond to it can water down the horror of war. Can the common man at all do anything? Will it make a difference? The answer to these questions calls forth the tool that this work activates within – the consciousness of strength, of an ability to break out of passivity or apathy as a common person; and we connect with special editorials by Dr. Aniruddha Joshi, which are in a way, sequels to this work. He talks of what the Indian citizen ought to do here on, as also of the changes that need to be made to strengthen the nation; ‘the satyagraha committed to co-operation’ that went on to give specific guidelines as to how simple it is to voice your say, to communicate with those in power., how the people are the decision makers in a democracy and that they can the politicians, who owe their power to the people. The most fabulous aspect of this work is that it does not end when we shut it. It becomes part of us, constantly keeping active, ‘a certain tool’ within. And so the work ‘The Third World War’ will not be on your bookshelf to become just another part of your collection. This is a major work for reference you will keep reaching out for, a study that you will need to keep going back to. A work beyond its physical hard covers, beyond time and beyond boundaries of nations.